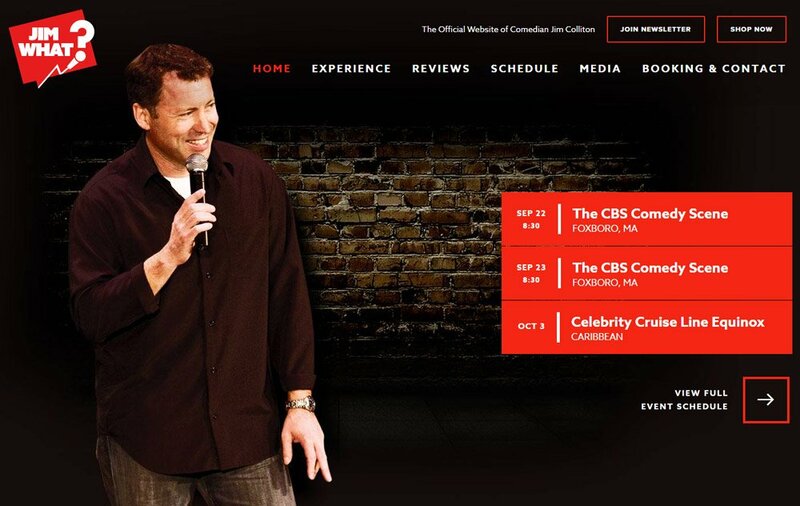 Comedian Jim Colliton is a stand-up star who has been making people laugh his entire life. He's been featured on popular television networks like Comedy Central, NBC, FOX and AXStv. Jim's comedy material is mostly based around his life as a dad and husband. Folks from all over the country have brought Jim in to provide funny, clean comedy, whether it's been for corporate and private events or fundraisers. So why is it JimWhat.com? Because no one could spell (or say) Colliton and thus, JimWhat.com was born. 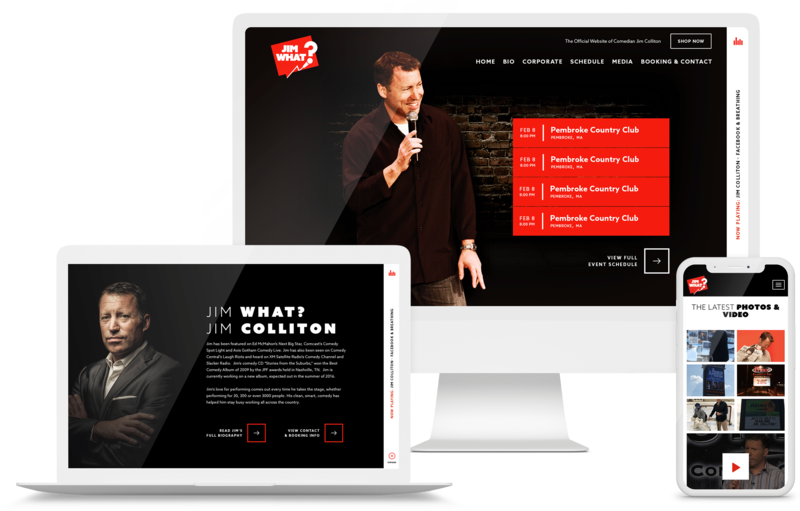 GoingClear Interactive was responsible for both the web design and development of the new JimWhat website. One of the great new features that we focused on was a dynamic Schedule page that includes upcoming and past event details. The new website also includes a sticky header, high-resolution photography, a Reviews page for corporate and public events and a new newsletter sign up form. We also incorporated social media on the site, including on the Media page with Jim's live Instagram feed and a customized Twitter feed that swipes on mobile devices. We also designed the new JimWhat logo, which we had printed into cool stickers that Jim can give out at shows. The new website was built using WordPress as the CMS (Content Management System), allowing all text and photography to be updated easily. Like all of the new sites we build, JimWhat is mobile and tablet friendly, ensuring visitors have a flawless experience on any device. 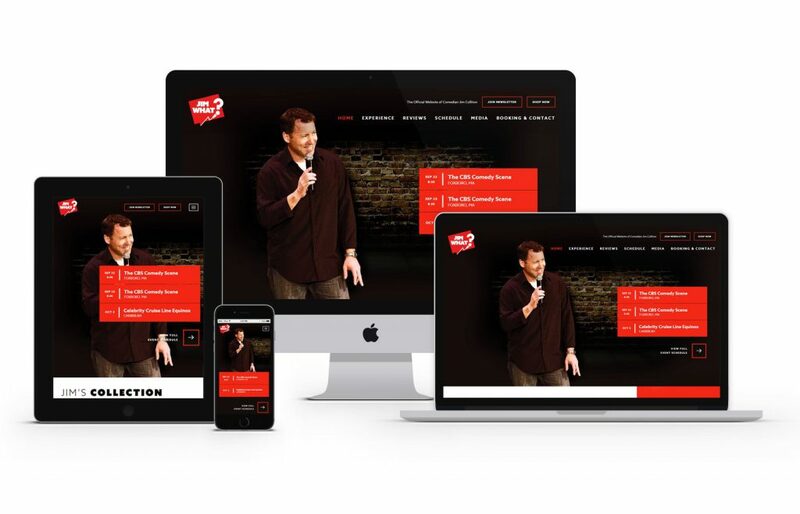 Jim might be big on laughs but his new website is big on style!